Choose between our three tastings of Classic, Red or White for $9/person. 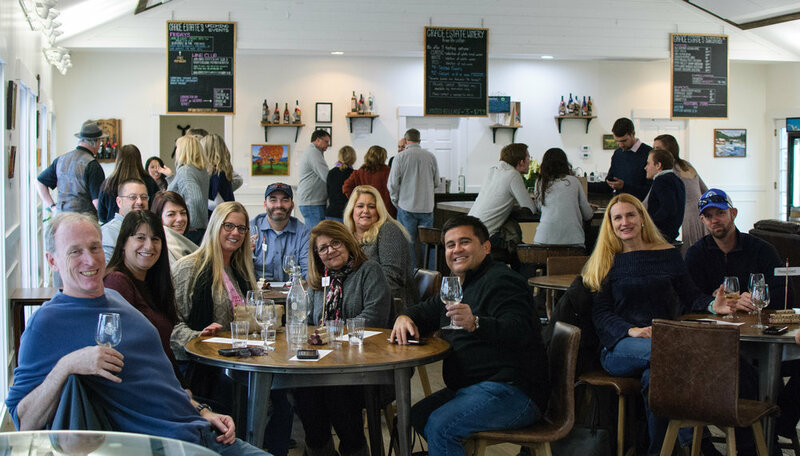 Larger parties may reserve a Group Tasting with reserved seating for $12/person. We offer tastings up to 15 minutes before close every day. We have a selection of salami, cheeses, baguettes, and more available in the tasting room. These items can be ordered as part of a charcuterie board. You’re also welcome to bring your own food. We have a spacious patio with amazing views, corn hole sets, picnic tables, and free guest wifi. All of these are free to enjoy any time that we're open. We welcome furry friends outdoors, but due to recent regulatory changes, we are unable to have pets in our tasting room.